Set up in 1975, Top Screw specializes in developing and making blind rivets, blind rivet nuts, bolt rivet nuts, self-tapping threaded inserts, security male/female bolts, clinching parts, binding posts, security fasteners, blind jack nuts, welding studs and customized parts, which are exported to Europe, North America, the Mid-east, Southeast and Northeast Asia. Well-equipped with the latest production equipment including precision cold-forging press, auto-in-feed tapping machine, automatic sieving machines etc., we fill custom orders of various designs, specs with maximized tapping capacity. 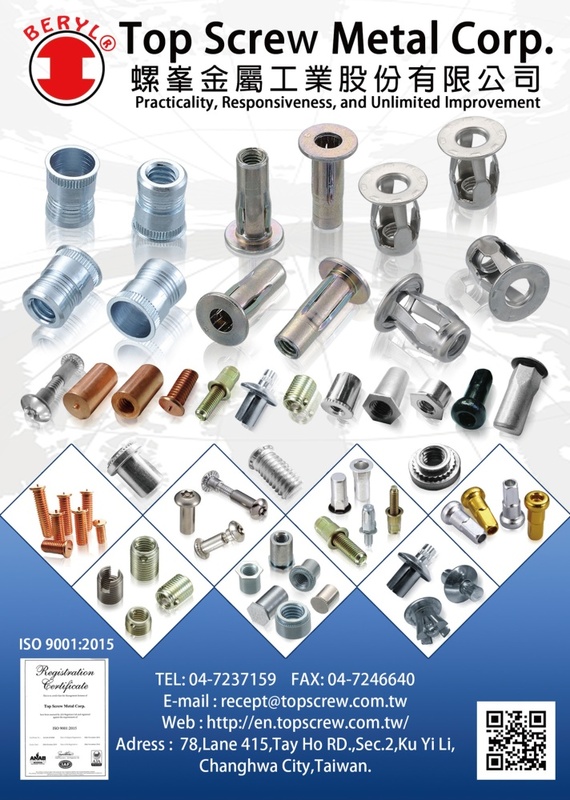 Ask us about wide ranging, quality, cost-effective fasteners and more. * Over 30 years’ experience in customization according to shop drawings and samples to offer products meeting IFI, ISO, DIN and JIS standards. * Thousands of types of screws, blind rivet nuts and rivets in stock to meet demands. * Efficient, integrated production from wire rods to finished items that reduces labor, effectively controls quality to maximize output with shorter lead-time.